Painting the background | Picture This! Daily life among the Dagara, or any people group in Burkina Faso, is full of activities geared toward survival. Life is hard: the terrain and climate are unforgiving; resources are scarce or non-existent; and the mindset of generational poverty limits what the average person even dreams he can accomplish. Yet the people are full of life, love, friendship, and joy. In the articles to follow, I will be going into more detail about the various aspects of the culture with the goal of spreading understanding and compassion. In order to truly understand the people, it’s important to paint the background picture, which in this case is the terrain and climate of Burkina Faso. 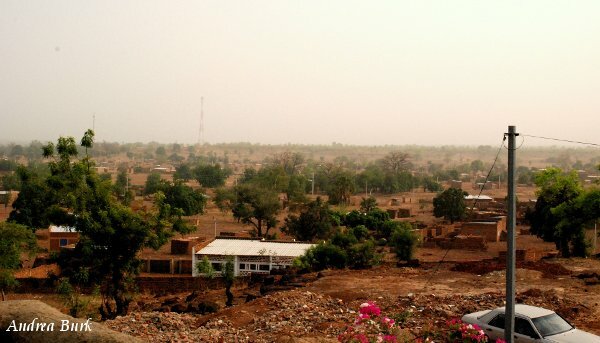 Although rather small (about the size of Colorado), Burkina has some variance in climate from more tropical in the south to the borders of the Sahara in the north, called the Sahel. In this semi-arid tropical environment, there are only two seasons: rainy and dry. The rainy season lasts from about May to September in Dagara-land, with the transition months of May and October being particularly humid and uncomfortably hot. During the dry season, the Harmattan winds come down from the deserts in northern Africa, bringing with them so much dust that the air is full of it and even partially blocks the sun. Because of this, temperatures can be cooler during the months of December to February, yet are gradually heating up to the hottest time of the year in April. The dry season terrain. Notice the hazy, dusty sky. A similar view at the end of rainy season. Notice the same big house in the background and the peanut crop in the foreground. The grasses and weeds have grown so high they conceal small buildings. If you’ve ever been in West Texas on the hottest summer day imaginable, then you’re on your way to understanding the heat here. However, imagine that you don’t have access to any air conditioning and that you don’t have the comforting thought that fall and winter are coming. Also, most of your daily life is lived outdoors, dependent on the weather and the ground for your food. We all know how the weather can affect us. Yet, while we have people and technology predicting the next week for us so that we can plan our activities accordingly, the average person living in a village must exist in a somewhat flexible state of unpredictability. Another view of dry season from a rooftop on a hill. 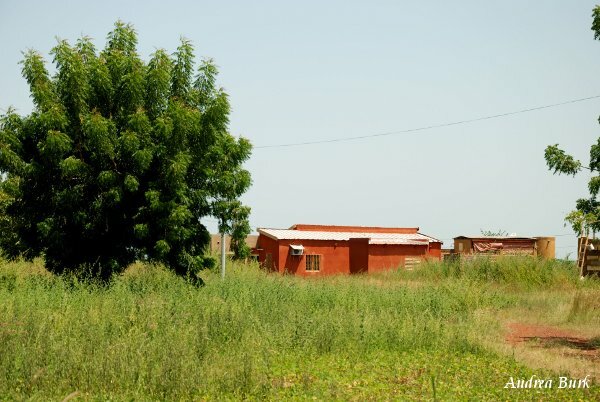 During the hotter times, we as foreigners may think that the Burkinabe are used to the heat, but they are affected by it just as much as we are. It’s just not possible to get a lot done when the temperature is oppressively hot. Because of this, there is a tradition here of getting up early in the cooler hours of the morning to get some work done, and then taking a sieste, or rest time, in the middle of the afternoon. This is changing somewhat and is not always observed, but most businesses still follow this pattern. This definitely dictates a slower pace of life for the whole country. And yet, the dry, hot season has its activities as well. The main food harvest of corn, millet, and peanuts has already taken place around October, and planting on a large scale cannot take place yet since nothing will grow without rain. Although there may seem to be a lot of idle time, cotton is harvested in December and dry season is a great time to build so the walls will have plenty of time to harden. Because people have some extra time that is not needed for the fields, this is also a great time for evangelism and literacy classes. Mud brick walls with mud mortar are typically covered by a thin coating of concrete or a manure and mud mixture. The wall of a school building in Yo Ba Gawn has fallen down because of so much rain. 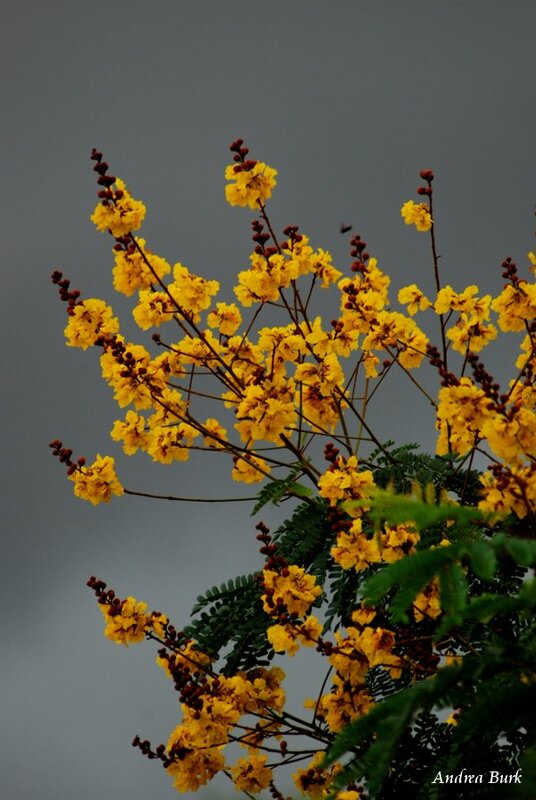 During rainy season everything is in bloom or green. Colors look particularly vibrant against a stormy sky. 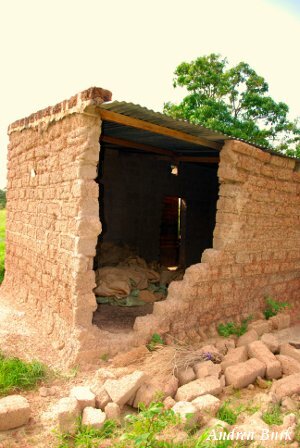 Water is more plentiful, but can also be an enemy when it rains so much that their mud brick houses fall down. It seems that every year a few people lose their lives in the night because a wall falls on them in their sleep. Some people even continue to live in these houses because there is no other place to go. It varies as to how soon they can get it repaired. With the rainy weather comes cooler temperatures, at least while it’s raining. Between rain showers it can get quite humid. However, in July and August there are days that are completely rainy and very pleasant. A farmer using oxen to plow. 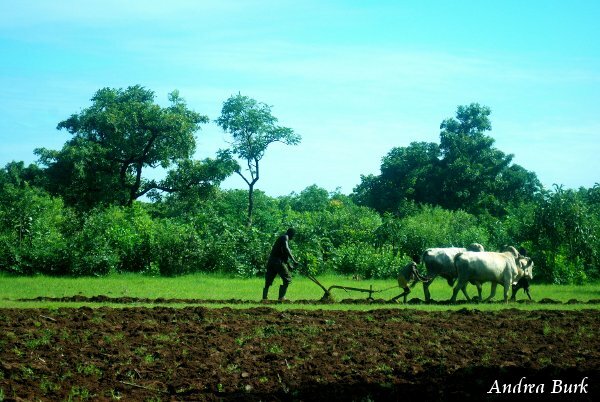 Working in the fields is a family affair as most is done by backbreaking personal labor using a hoe called a “daba.” It is short and requires that the user bend over to work. Some people might have plows pulled by oxen, or are able to rent them, but the majority rely on having large families. All of this has shaped the habits and thinking of the Burkinabe. Because they are at the mercy of the weather and have to rely on each other for survival, they have a tendency to emphasize events over time and people over tasks. This has profound implications for the economy and other aspects of Burkina life. Instead of having the expectation of working the set hours of 8-5, for example, the people have developed a more laid-back attitude. Although this can be a little difficult to get used to for the Western mindset which wants to have a task list of things to accomplish everyday, it is also a welcome change of pace. It is nice to be able to spend hours just sitting and chatting with a friend, developing a meaningful relationship, in part because you have given your time. Who you know and showing respect to those in authority also become very important in a people-centered society. Living in close relationships with others is vital. Families are so closely tied as a group that if one person starts to become successful, many others will put pressure on them to lift them up socially or economically as well. There is more emphasis on the community than on the individual, which can make it difficult to change one’s situation; however, the good side of this is that most people also have others they can rely on in times of trouble. What do you think? It’s not often that we who are more used to the conveniences of the “first world” even think about how the weather affects our society, other than to be irritated at the “bad” weather or grateful for rain after a drought. What effects have you noticed the climate having in your area? Does it affect your daily life or are you able to keep a fairly regular schedule anyway? Posted on October 17, 2011, in Uncategorized and tagged background, climate, daily life, seasons, terrain, weather. Bookmark the permalink. 6 Comments. I would love to hear from all of you who know Burkina! Please feel free to add to this and share your perspective, too. Wow, Andrea this is great! On my blog, I tend to just react to something specific that’s happening in my life here in Burkina and forget that most of the people I’m writing to don’t have my same experience. Personally, although I also live in Burkina, I thank God that we have outside support for our mission and don’t have to live off the land here (and therefore be so reliant on the whether for our well-being). Some of our fellow missionaries do more farming than we do, but even those who grow a lot of food know that they won’t starve even if their entire crop gets ruined. Not so for our Burkinabe friends. Thanks for “painting a background” that everyone can see so clearly. We live in Texas and had 100 days over 100 this summer–yet we knew fall was coming. Our drought has been extreme here in Wichita Falls. We got rain last week, 3.5 inches which doubled our rainfall since January. Yet, through it all, we had the knowledge that this was an aberation and not the “norm.” I admire the Dagara and during our visit in December and January, 2009, we were treated to the kindness and generoisity of their spirit. That drought was terrible this year! I felt so bad for you guys while we were sitting here in our rainy weather. Thanks for commenting! Great blog, Andrea! We’re excited anticipating seeing Burkina Faso with you and getting to meet some of the people. Thanks Diana! We’re really excited for you guys to come too! Thanks for commenting!